Google Chrome is no doubt great web browser and provides great user experience, but I get very irritated when all my downloads are being saved in the default location, so I decided to change it. 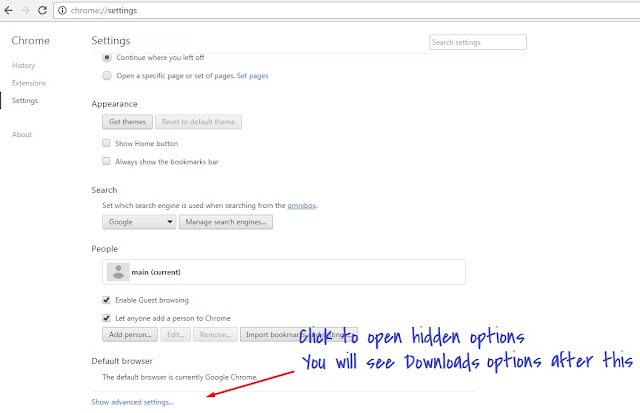 There is an easy way to change default download folder in Google Chrome running on any machine or operating system. Google Chrome saves all files to "Downloads" folder on your computer, but you can always choose to "Save As" option by right clicking on download buttons on web pages. 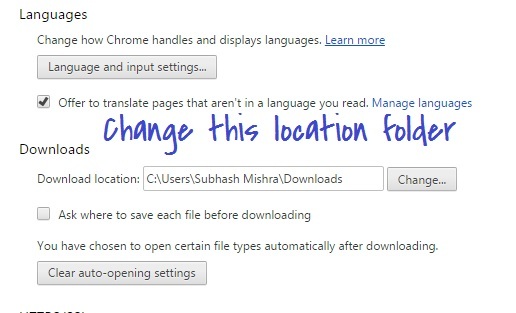 Many times right click and save as option doesn't work and you may want to change default download folder for Google Chrome. In this case, you can do it from "Settings" of your Google Chrome browser. There is an option to change your file download location. Default download folder can be easily changed to any folder located on your computer. Now find "Downloads" option from setting list. After that change "Download location." Once you changed the path for downloads, all downloads will be saved in the new location, and you can manage your files from there. This is not a trick but a useful method to change default download location. Also, But there are few useful extensions to sort downloads in Google Chrome with the help of extensions. Google Chrome have a default option to open downloads page, use Ctrl with J for it, but if you want to add an icon for download page, then you can use this extension from clean and straightforward to place a download icon near setting button similar to Firefox browser. Also don't forget to check guide to enable reader mode in Google Chrome.